Creating Beautiful Smiles in Parker... one smile at a time!! Dr. Tatarko's goal is to create a warm, caring dental environment within which you can feel comfortable. Quality dental treatment is our priority and the latest dental technology is present to achieve the highest standard of care. Digital X-Rays are used to minimize patient radiation and so we can view the images immediately. When you visit Parker Healthcare Center, your smile is our top priority. Dr. Tatarko and her entire dental staff are dedicated to providing you with the personalized, gentle care that you deserve. We truly believe that all that is good begins with a smile... so smile like you mean it! Any questions? Please contact us today at (303) 840-1900. 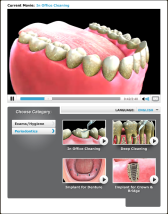 Dr. Tatarko encourages you to visit our patient education videos which provide valuable information on dental procedures and treatment options. We strive to make your dental visits comfortable and relaxing. Once seated in the operatory, you can enjoy the beautiful view of the Colorado Rocky Mountains while listening to stereo headphones or watching DVD movies. We have nitrious-oxide gas available to any patient who feels the need for extra relaxation. We enjoy all of our kid patients also! Our Parker dental office has a fun kid's play area and our treatment rooms are very kid friendly. Parker, Colorado Dentist, Dr. Olga Tataroko is dedicated to cosmetic dentistry such as Exams, Teeth Whitening, Veneers and more.